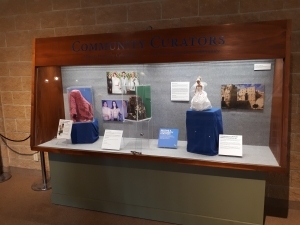 Sinead Cox, the museum’s Curator of Engagement & Dialogue, introduces the museum’s latest temporary exhibit, Community Curators: Newcomers (on display now). From storage and display methods, to how and when we handle objects, museum staff endeavour to protect the artefacts entrusted to our care from the manifold dangers of shifting temperatures, chemical reactions, pests and damage–to preserve each and every artefact for future community access based on its unique needs. I encountered a new artefact-care dilemma recently however, when I had to think about the best way to preserve and protect an artefact’s existing smell while on display. The 2018 participants for the museum’s recurring ‘Community Curators’ exhibit are both newcomers to Huron County. 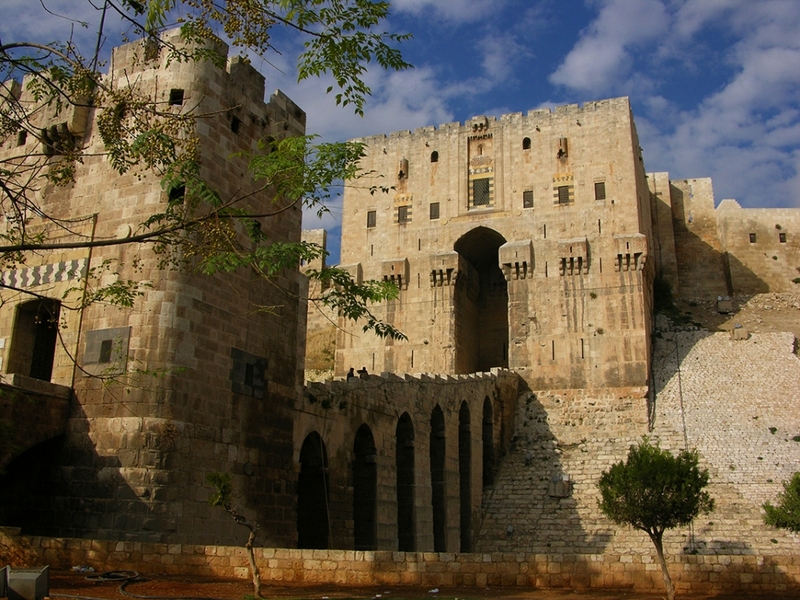 Instead of choosing an object from the museum’s collection like previous guest curators, they have very generously loaned an artefact of their own. Siham Mohammed of Wingham and Baraa Ahmed Al-Ali of Ashfield-Colborne-Wawanosh both fled with their families from war in Syria, and came to live in Huron County as sponsored refugees. I asked each volunteer curator to select an object or objects that related to their personal story or home country, and to translate the name of that object into English and their first language (Kurdish for Siham, Arabic for Baraa). 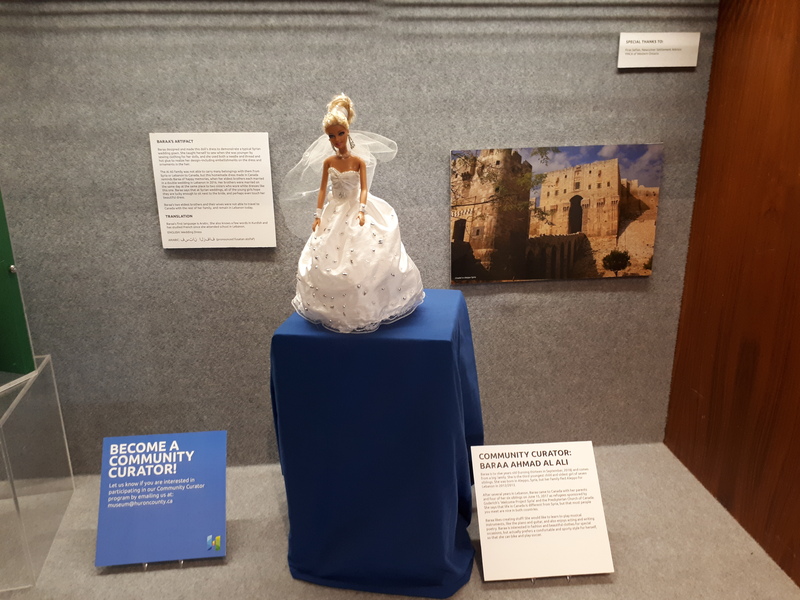 Because her family had few belongings when they came to Canada, twelve-year-old Baraa used her creativity to design and customize a doll’s dress to represent a typical Syrian wedding gown. Baraa’s handmade design evokes happy memories of family weddings in Syria and Lebanon when all of her brothers and sisters were still together. Siham loaned two scarves that she has carried with her since she left Aleppo with her husband in 2011, first fleeing to Turkey for safety and eventually being matched with her new home community in Wingham. The scarves belonged to Siham’s mother, who she hasn’t seen since she left Syria. Although the scarves have lovely floral patterns, Siham doesn’t wear them in Canada as fashion accessories; she keeps them as keepsakes that remind her of her family still in Syria. The scarves remarkably still smell like her mother: strongly of jasmine perfume and more faintly of cigarette smoke. The museum is very honoured to temporarily host such significant artefacts, and I knew it would be important to preserve the distinctive and familiar odour that adds so much personal value to the scarves. After consulting with our Museum Technician, Heidi Zoethout, we decided to encase each scarf individually in smaller plexi-glass boxes in the larger display case. Visitors will just have to imagine the strong flowery scent, and maybe think about what home smells like to them. There are many objects donated to the museum’s permanent collection with similar stories: precious items carried from Ireland, England, Scotland, Germany, Holland or India brought with immigrants starting new lives in the presence of something that evokes the familiar sights, sounds, feelings, or scents of home. When the journey demanded that other possessions be sold or left behind, these were the items that remained. And that is really why, in my estimation anyway, it matters to pay attention to and try to preserve the texture, vibrancy, and integrity of these objects as much as we can—their value isn’t always something that you can put a price tag on, but it can encompass a sense of the past that you can see, touch, hear, taste or sometimes even smell. To learn more about our curators’ stories, you can visit the Community Curators exhibit in the upper mezzanine of the Huron County Museum this summer. If you would like to be a community curator, contact us at museum@huroncounty.ca.